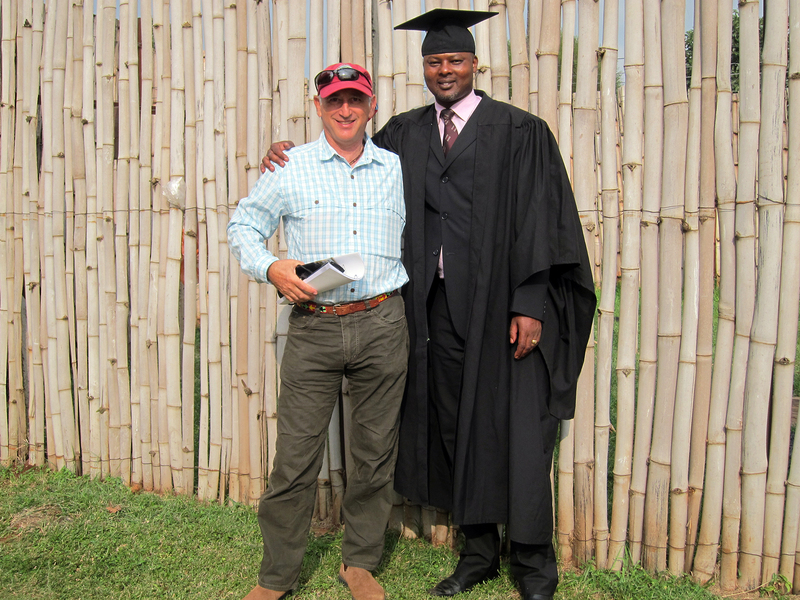 As I write this blog I am grinning from ear to ear as I have just returned from the graduation ceremony of my “rafiki” (friend) Patrick Olepapatiti who graduated with a degree in international business administration from United States International University. The campus of USIU, which has a student population of about 5000, is a beautiful peaceful campus set amid the hustle and bustle of Nairobi. 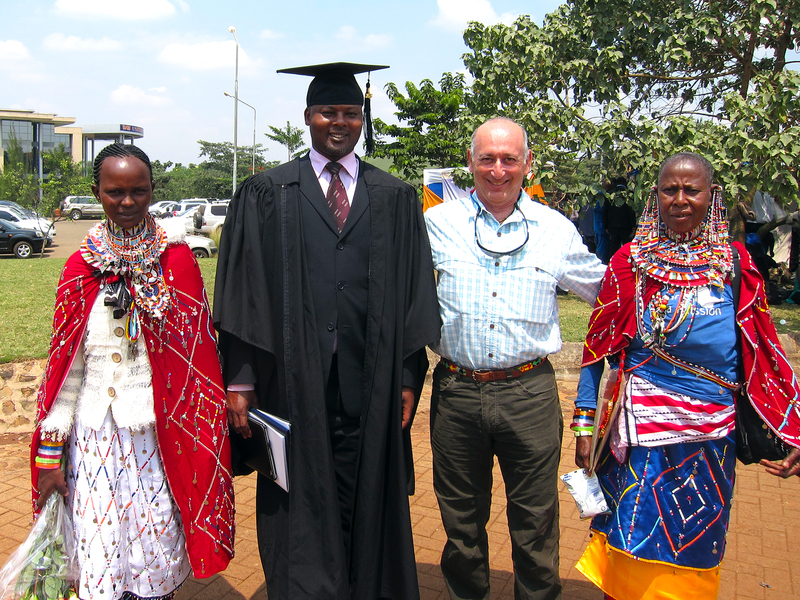 It was there I met Patrick in his cap and gown instead of his traditional Maasai robes or safari gear. Watching graduation was fun and I was beaming with pride because I had gotten to play a part in Patrick’s success by helping support his education and providing some mentoring from time to time. I have told you Patrick’s story before which you can read here. Patrick, being Maasai (and being Patrick) would not smile as he marched in the processional but I could tell he was really proud and happy. The graduation was very similar to graduations here with cheering families; photo taking, proud parents, the brilliant valedictorian and the graduation speaker, who was Robert F. Godec, the U.S. Ambassador to Kenya. However, unlike my son’s recent graduation from UC Santa Cruz, this ceremony had some African themes with a stirring African choir, very unusual (to me) names of students and all different types of traditional dress. During the ceremony I got to spend time with Patrick’s wife and youngest child and an older relative whose relationship to Patrick I never quite got, All were very proud. Then something happened that I did not expect: After leaving the campus we stopped the car just outside and all of a sudden an instantaneous Maasai celebration broke out. More than 50 people from Patrick’s village were there! They had started their journey at 3 a.m., to travel 4 hours by specially hired Matatus, which are the region’s ever-present minivan taxis. 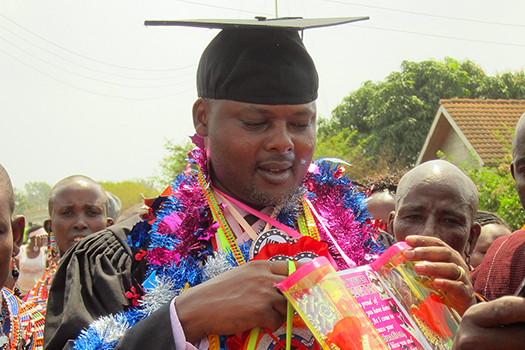 They surrounded Patrick and celebrated his graduation by showering him with beaded necklaces, garlands and congratulation signs. 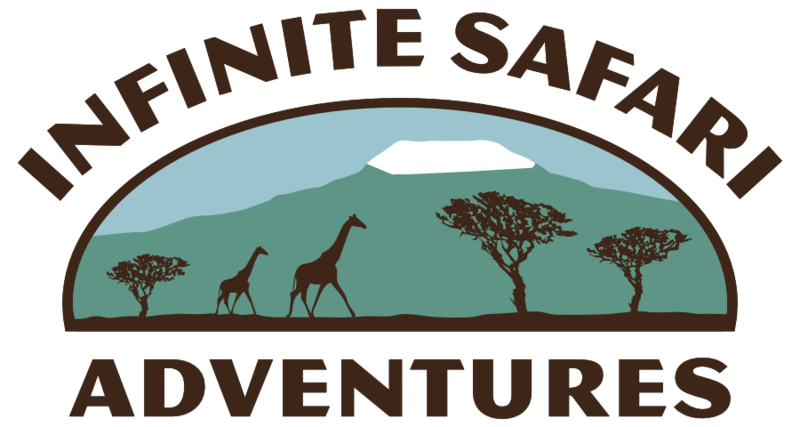 Patrick now has a job with the Kenyan Parliament; we are still running our Maasai beaded dog collar business (I picked up more and soon you can now order them on the Infinite Safari web site) and there are a few other business ideas percolating. Stay tuned as shortly I will tell you how you can help bring a well to his village so the women do not have to walk 5 miles to get water. It was a very happy and proud day. 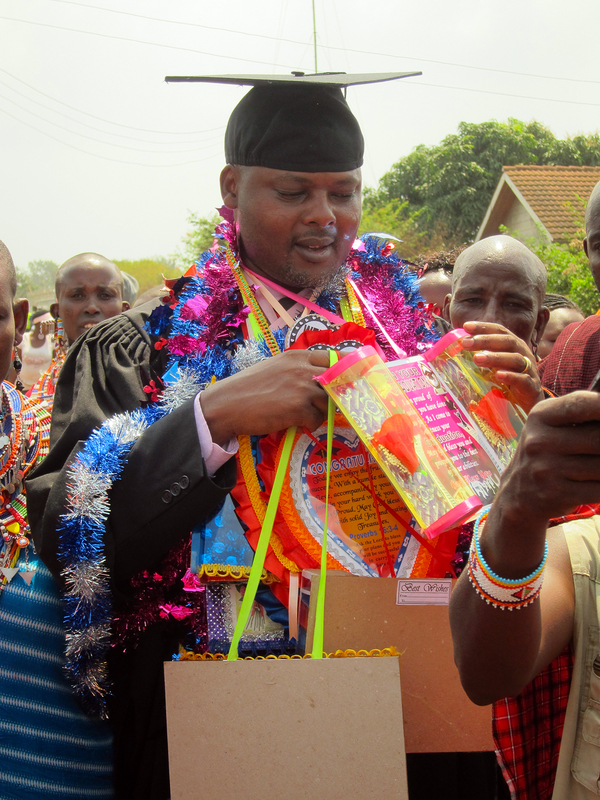 So what do you give as a graduation present to a Maasai who just graduated from college? It is not that different anywhere. I got Patrick what he wanted – an iPad! p.s. – and what makes this graduation post even more special is that today is my birthday!